Meet Mr. White Sweet Potato. He’s mildly sweet and has the texture of a sweet potato but looks a little more like your Idaho potato in color. Meet Mr. White Sweet Potato! I brought the ketchup to the table, but totally forgot it was there (meaning, it was so good on it’s own that ketchup would . I served it with the Balsamic-Glazed Roasted Asparagus with Crumbled Blue Cheese (blog post to come) and then it advanced from amazing to amazing times a million! The only thing better? 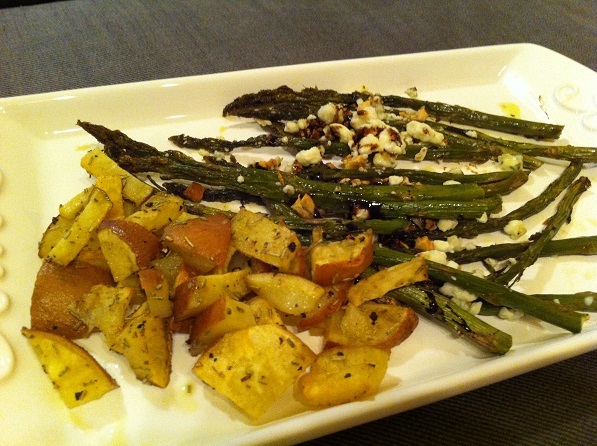 Serving it with Balsamic-Glazed Roasted Asparagus with Crumbled Blue Cheese. Preheat oven to 365F. 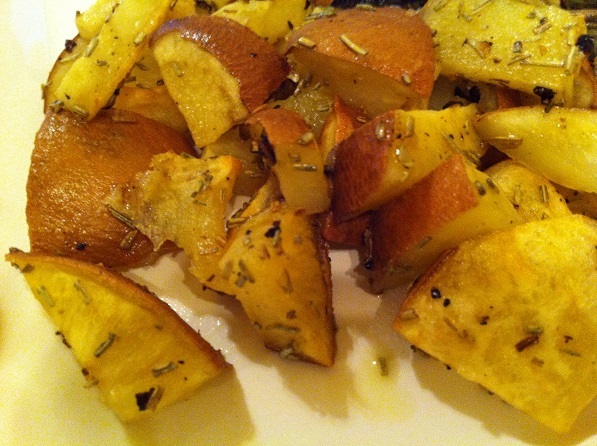 Cut potato into 1/4″ slices. Chop slices into pieces of equal size. Place in a baking dish. 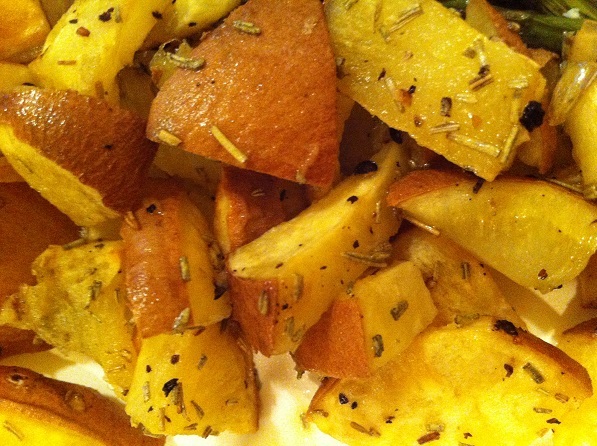 Drizzle with extra virgin olive oil and sprinkle sea salt, freshly ground pepper, and rosemary on top. Toss to coat and evenly distribute on baking dish. Bake for 35 minutes or until tender and lightly brown. 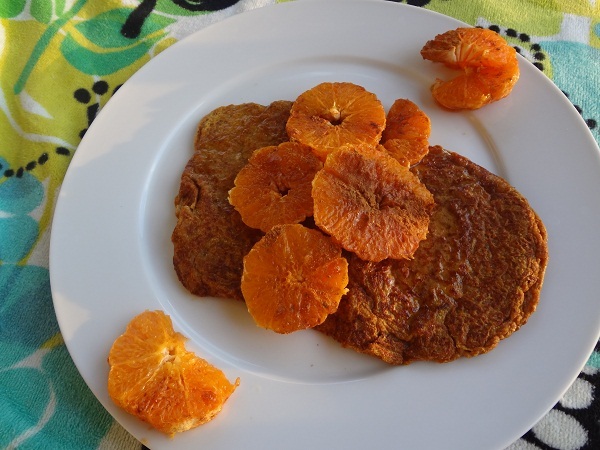 Nutrition note: Can’t think of another source of vitamin C besides citrus? The potato is an excellent source of vitamin C, too! I loved the smokey flavor! There’s nothing girly about this recipe either. Drain tofu. Wrap it in paper towels and place on a plate. Set heavy pots and pans on top to further drain tofu. Let sit for 30 minutes. Remove paper towels and slice tofu into thirds (sandwich-style). 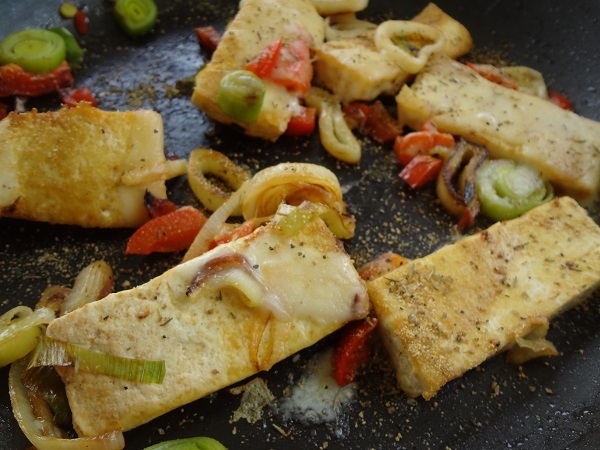 Stack pieces back together and slice into thirds to create 9 pieces of tofu. Heat a large pan on medium heat. Pour canola oil in pan. Add tofu slices. Cook for about 4 minutes or until light golden brown. Meanwhile, wash leeks well to remove dirt and slice the whites into rings (discarding the dark green thick leafy part). Chop bell pepper. 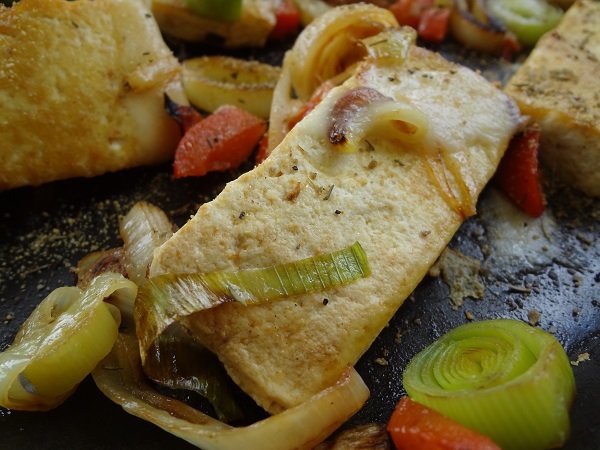 Flip tofu with a heat-resistant spatula and add leeks and bell pepper. Place a lid on top of the pan and cook for about 4 more minutes or until leeks and bell pepper are soft and lightly brown. Remove lid and add slices of cheese on top. Sprinkle with rub and serve. Serving suggestion: Serve with little pieces of bread to make a few mini sandwiches. 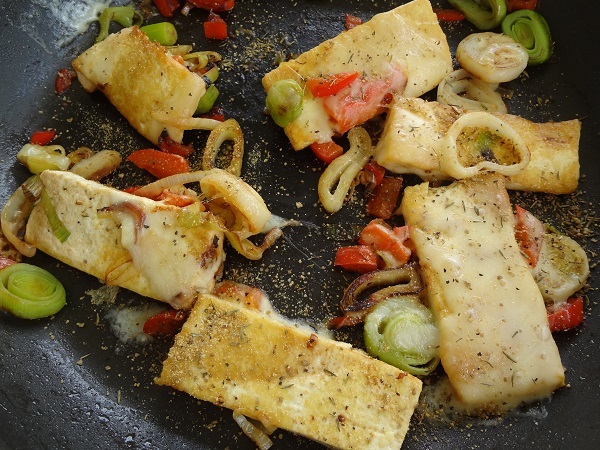 Nutrition note: Tofu is a non-meat source of protein and comes from soybeans. Jamie says: I hit the nail on the head with this one. The recipe is a combo between 1) a madeover throw-back to the Poppyseed Pancakes with Spiced Clementines (from the cookbook we gave my Mom years ago for Christmas) that my mom used to make us as kids and 2) the hearty pumpkin pancakes I made K when she spent the weekend here. Sweet clementine, oh, oh, oh… I couldn’t help but think of the song. 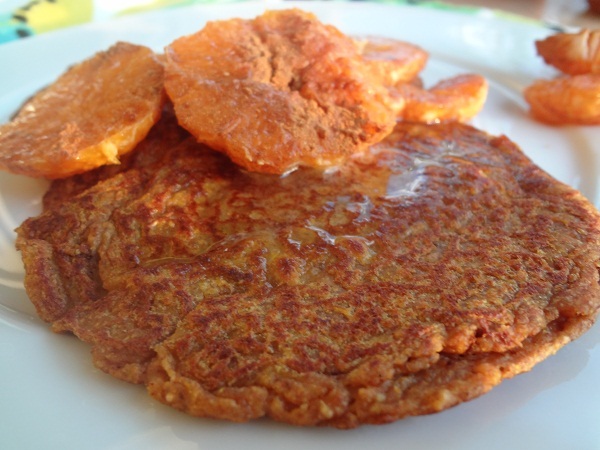 I love the golden color and hearty flavor of whole wheat pancakes. The awesome sweet and hearty flavors will surely brighten your day. Peel clementines. Slice. Gently toss with brown sugar and 1/4 tsp cinnamon. Refrigerate. 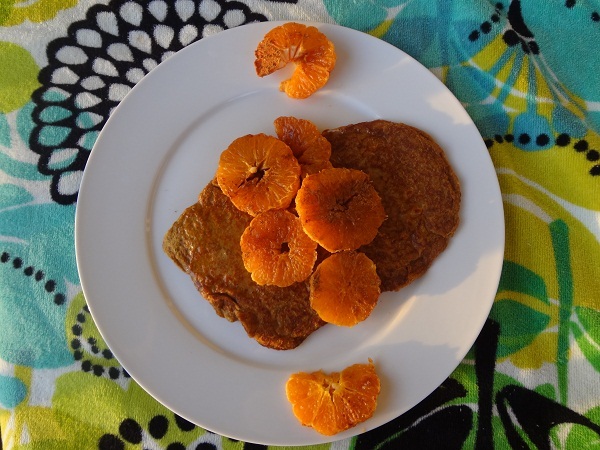 In a medium bowl, use a fork to combine pancake mix, water, pumpkin, 1 tsp cinnamon, chia seeds, vanilla powder. Pre-heat a large saute pan on medium heat. Coat pan with no stick cooking spray and pour 1/2 of pancake batter onto pan to make three pancakes. Cook until bubbles stop forming and bottom of pancake is golden brown, about 1 1/2 minutes. Flip to cook other side and cook until golden brown, about 1 minute. Place on a serving plate. Repeat once more using remaining batter. Plate pancakes. Spread buttery spread on each pancake. 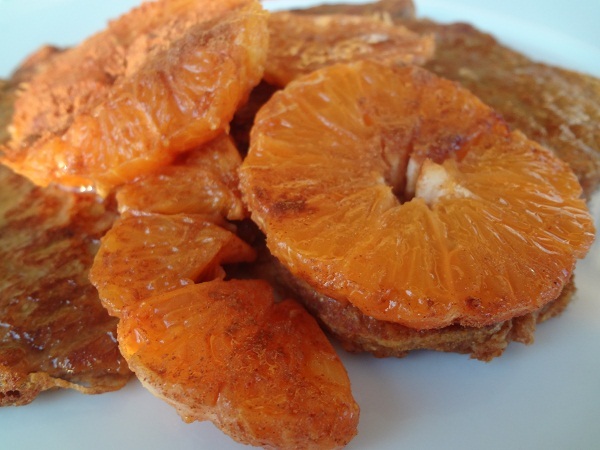 Top with cinnamon-sugar clementine rings. Enjoy! Serving suggestion: Serve with glasses of fat free milk. Nutrition note: Chia seeds pack in fiber (so does the pumpkin and pancake mix), and add omega-3s, vitamins, and minerals like calcium. Pumpkin also adds vitamin A. And the clementines are a vitamin C knock-out. Jamie says: My goal: to find something to do with the last of the orange juice. The result? Awesome homemade ice pops that I want to make again ASAP! Bursting with color and flavor! Pop in your mouth for a naturally-sweet treat. 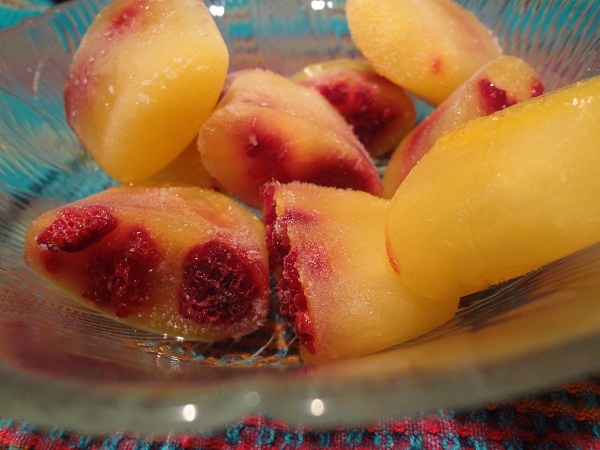 I loved how they were easy to bite into- like a soft ice pop (not like a hard ice cube). 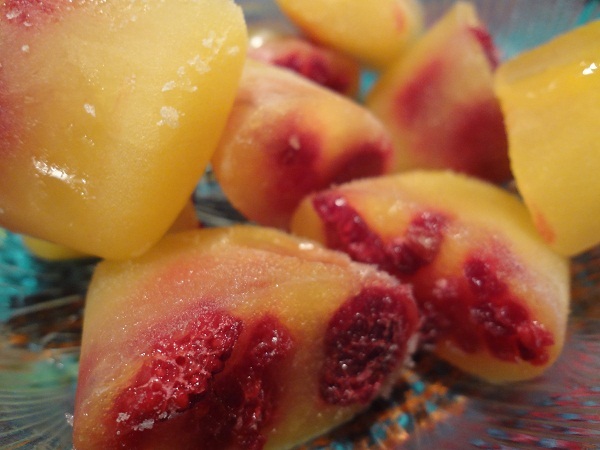 Divide frozen raspberries among sections in ice cube tray. Pour orange juice on top. Freeze until solid, about least 1 1/2 hours. Enjoy now or later! 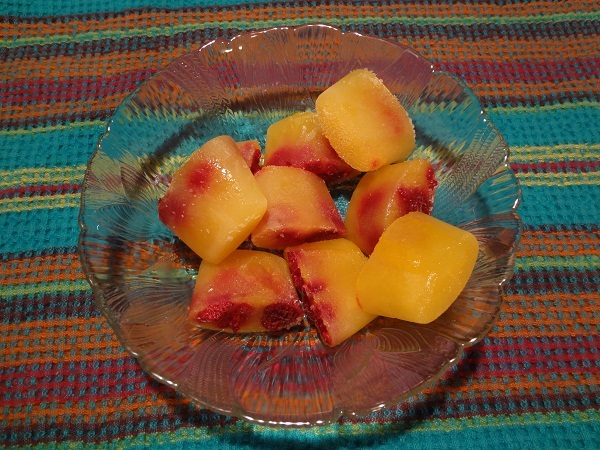 Nutrition note: Fruit is a perfect dessert. 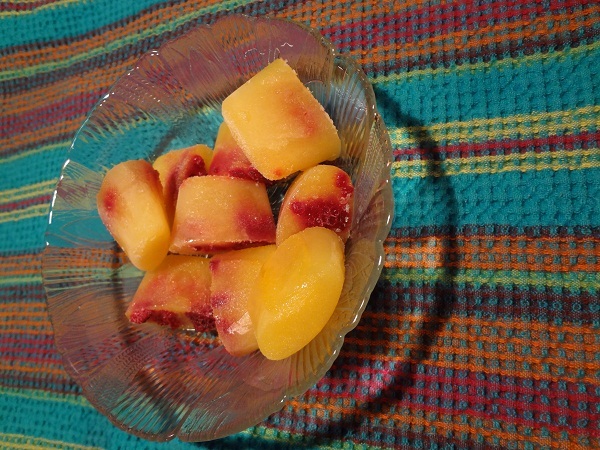 These pops are naturally sweet (no added sugar) and have vitamin C and fiber. 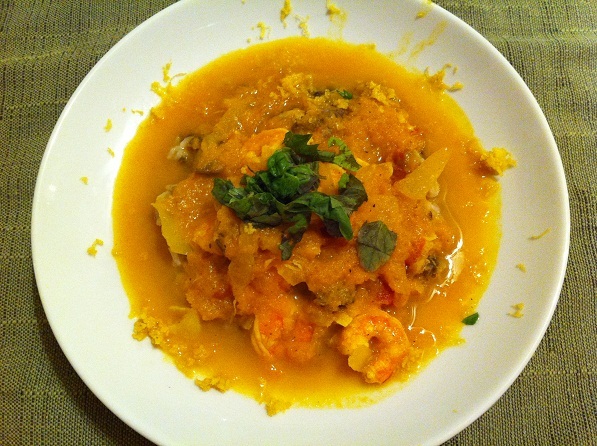 Jamie says: My inspiration for this dish started with a recipe (Pumpkin Shrimp Curry– you can see I didn’t go the pumpkin route) and my desire to try foods from different cultures. I’ve been curious to experiment cooking with coconut milk- and here is my creation: Creamy Curry Butternut Squash Soup with Shrimp. 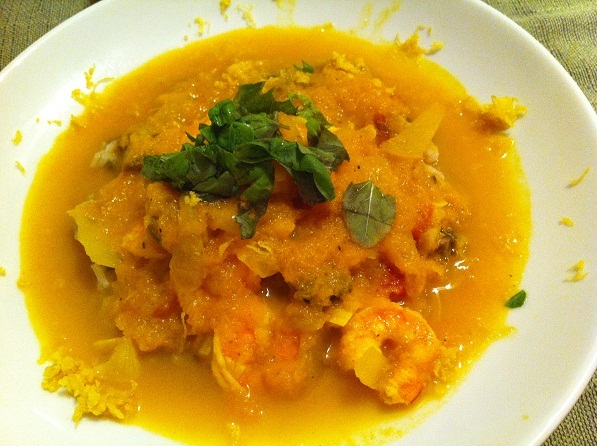 The curry and squash made it quite colorful and very flavorful. The dish provides a fresh take on squash. In a small/medium pot, add rice blend and 2 cups water. Bring water to a boil, stir, reduce heat to medium-low, and cover with a lid and cook for 18 minutes. Remove from heat. (Rice can also be cooked ahead of time and refrigerated or frozen and defrosted). Chop onion. Mince garlic. Chop bell pepper. Chop tomato. Zest and juice lemon. In a large pot on medium heat, add extra virgin olive oil and onions. Saute until lightly brown, about 6 minutes, stirring occasionally. Add minced garlic, and heat for 1 minute, stirring occasionally. Add bell pepper, then add butternut squash followed by broth, coconut milk, curry, ginger, tomato, mushrooms, and lemon juice. Add lid to pot. Remove tails from shrimp and add shrimp to pot. Chop basil. Divide rice among individual bowls. Pour soup on top. Sprinkle lemon zest on top and on the rims of the soup bowls along with fresh basil. Enjoy! Nutrition note: Butternut squash makes the soup thick and creamy without adding extra fat. Choose a reduced fat coconut milk to cut back on the saturated fat.